Are you ready for the apocalypse? 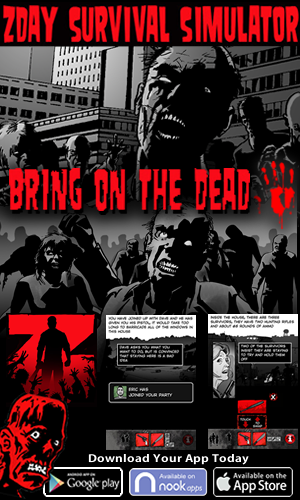 Do you have what it takes to survive in a world of flesh-eating zombies swarms and nothing but your wits and a few weapons to protect yourself? Find out what you’re really made of with our award-winning strategy games for the iPhones, iPads, Android devices, and the Nook Color. Download ZDAY Survivor Simulator to find out how you’d perform the day the zombie apocalypse begins. 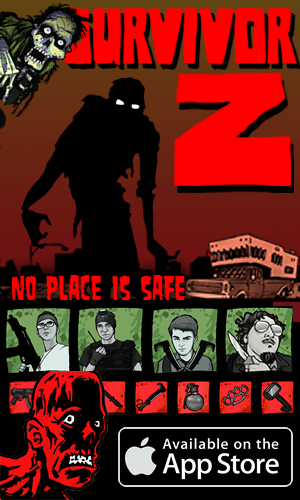 And if you play while you’re on the go, you’ll love Survivor Z – the only text-based zombie strategy game that gives you different scenes depending on where you’re located… at home, at work, a school, at a restaurant… the challenges are always evolving! Can you handle it? There’s only one way to find out. Download now.